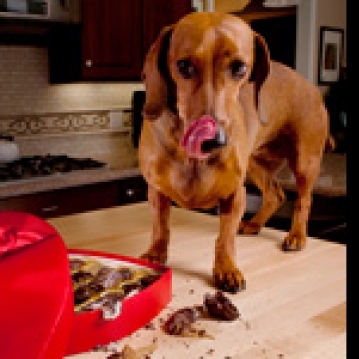 Home / Articles / Pets / Ask the Pet Expert / Why Is Chocolate Bad for Dogs? Dogs and chocolate are a dangerous and poisonous combination. Unfortunately, in most cases the chocolate wins. It’s a lot like alcohol and people. It all tastes so good, but the side effects are not positive. The idea that chocolate is bad for a dog is not a myth parents tell their kids to keep them from feeding the dog food from the table. It’s the real deal. Depending on the amount of chocolate a dog consumes, they will become fairly ill or even worse, die. Most pet owners fully understand the notion that chocolate is bad for dogs, but many don’t know why. Chocolate is bad for dogs because it contains very high amounts of fat and stimulants that resemble caffeine such as methylxanthines. The very same stimulants that produce those endorphins to make us feel good are the same ones that could potentially hurt your dog. The biggest takeaway from understanding why chocolate is bad for dogs is realizing the amount of methylxanthines that are present in the kind of chocolate your dog might have eaten. What this really means is that all chocolate consumed must be treated differently because they all come with different levels of fats and stimulants. If a dog ingests significant amounts of methylxanthine, dangerous clinical effects are produced that can cause your dog to pant heavily, vomit, diarrhea, excessive thirst and urination, hyperactivity, abnormal heart rhythm, tremors, seizures, and in severe cases death. A good rule of thumb is the darker the chocolate the more dangerous it is, as the methylxanthine content is higher. Typically white chocolate has the lowest methylxanthine content, while baking chocolate contains the highest amount. It only takes as little as four ounces of milk or half an ounce of baking chocolate to cause serious problems in a small dog. That comes down to just over a bite! Imagine what could potentially happen if that same small dog ate an entire tray of homemade brownies filled with baker’s chocolate. You are looking at an immediate visit to the vet. In addition while white or lighter forms of chocolate may have less of an impact, the high level of fat content can still cause your dog to vomit or suffer from diarrhea if ingested. 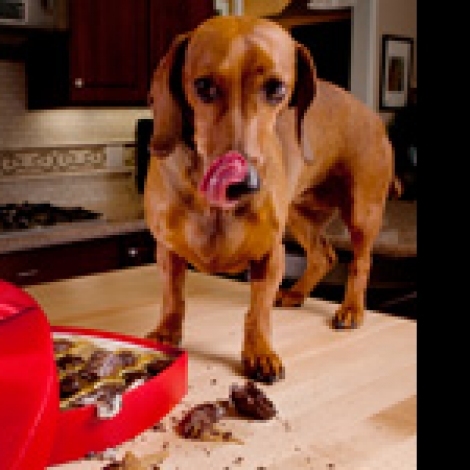 Another critical side effect of a dog consuming chocolate is inflammation of the pancreas, which causes pancreatitis. Be very mindful of what your dog eats from the table. If you think your furry friend has eaten chocolate, especially the darker kinds, contact your local vet right away. His health is important, so make sure to feed your pooch food that will help it live a longer and fuller life.